Check-in time is after 2pm. Check-out time is before 1pm. For cabins, check-out is 12pm. Depending on site availability, early check-in is possible for an additional $5/hour charge for RV sites and $10/hour for our cabins. The same is true for late check-out. Please call ahead. All reservations must be paid in full by credit card at the time of booking or paid by check/cash within three business days after making the reservation. Must be 21 years or older to register and stay alone on a site. Rates for individual sites are based on one family. 4 wristbands are included with your reservation. Each additional wristband is $10 and good for your entire stay. Maximum site occupancy is 8. 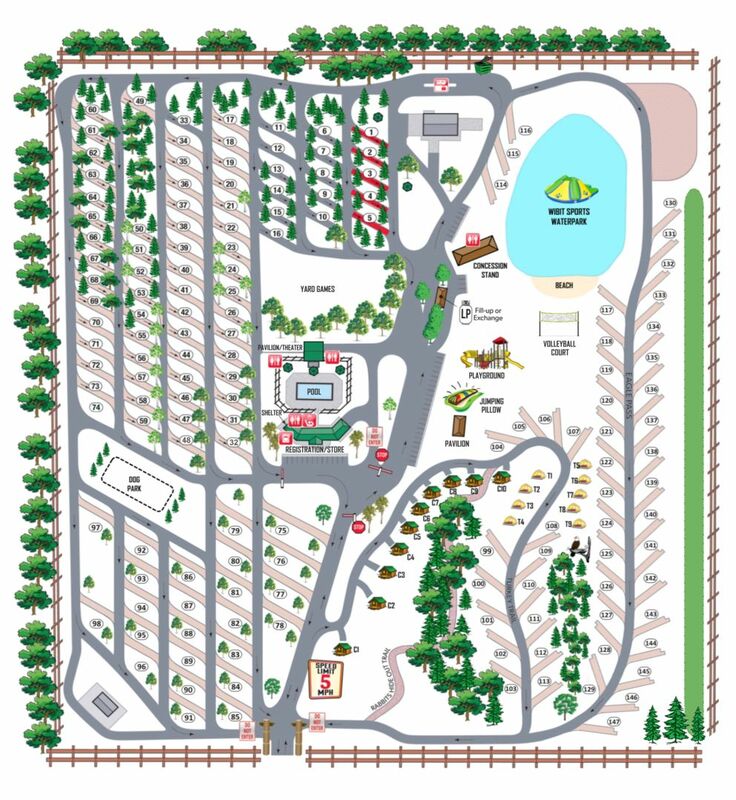 Sites are priced for two tents OR one RV. It is an additional $20/night to add an extra tent. Two vehicles are permitted per site (if space allows). The first is free, the second is $5. We do not give cash refunds. Reservations must be cancelled fourteen (14) days prior to your arrival date to receive a gift certificate for the amount paid minus a $25.00 processing fee. Reservations cancelled within fourteen (14) days receive no refund. Cabin reservations must be cancelled twenty-one (21) days prior to your arrival date to receive a gift certificate for the amount paid minus a $25 processing fee. Cabin reservations cancelled within twenty-one (21) days receive no refund. There are no refunds for cancellations over holiday weekends. We do not charge extra for sunshine and we do not refund for bad weather. Please remember to notify our office of any discounts or coupons you would like to use when the reservation is made. Discounts/coupons cannot be applied after the fact. There will be no refunds for coupons/discounts. No items are to be tied, nailed or screwed to trees. Do not alter any part of the campsite such as shrubs, tree branches, fire rings, etc. Each campsite has one fire ring and one picnic table. If you move your table, please put it back. Campfires are allowed in the provided fire rings ONLY! Please do not move the fire rings. 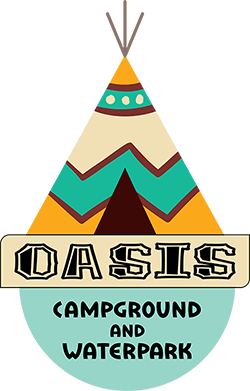 Please place garbage in bags and deposit in the dumpsters located on the north end of the campground near the dump station and near the totem poles as you exit the campground. Trash pick-up service is not available, so please do not leave it on your site. Do not trespass on surrounding properties. Fireworks and firearms are not permitted in the campground. Camper agrees that any photographs taken by staff, which they or their family appear in, may be used for advertising purposes. Children under the age of 13 must be supervised by an adult at all times. Please bring your own linens, blankets, pillows, kitchen utensils, plates, pots, pans, glassware, etc. Smoking and pets are not permitted in cabins. There is a $50 cash deposit at check-in. Please be considerate of others. We enforce quiet hours in the campground from 11:00pm to 8:00am. Minors must be supervised and back at your site by 11pm. Campground staff may remove anyone due to disruptive behavior. Please alert your guests ahead of time that they must register at the office and get a parking permit ($5 per vehicle). If they are planning to be at the pool or beach, then they need to purchase a day pass ($15 wristband per person). All guests must leave the campground before 10pm. Campers are responsible for the conduct of their guests and are personally liable for any injuries or property damage arising from the actions of such guests. We have a lot of little campers so please obey the 5 miles per hour speed limit throughout the campground! Do not park vehicles on grass. If vehicles do not fit on gravel pad, they may be parked in the over flow parking in front of the office or near the jumping pillow. DO NOT park extra vehicles in empty sites or along the roadways. All vehicles must display a valid car pass with site number. Mini bikes, dirt bikes, scooters, kiddie cars, hoover boards are not permitted. ATVs are allowed in the ATV section of the campground only. Golf carts are available to rent at the camp store. Personal golf carts may be brought to the campground so long as proof of insurance is provided and it is registered at the office upon check-in. There is a $20 fee, per day, for personal golf carts. They must be electric and display a valid parking tag at all times. All drivers, of a rented or privately owned golf cart, must have a valid driver's license to operate said vehicle on our property. Bicycles ridden after dark must have lights. Do not cut through other campsites with golf carts, bikes, cars or by foot. Please stay on the paved roads. There is no lifeguard on duty at the pool or the pond. Children under the age of 13 must be supervised by an adult at all times. Swimming pool hours are from 9:00am to 8:00pm. Life vests by the pond are for the waterpark area only and are NOT to be used in the swimming pool. EVERYONE AT THE BEACH OR BY THE POOL MUST HAVE A WRISTBAND ON. If you forget them at your camper you will be asked to leave and go get it. For insurance purposes, the following breeds are not permitted in the campground: pit bull terriers, staffordshire terriers, rottweilers, german sheperds, presa canarios, chows chows, doberman pinschers, akitas, wolf-hybrids, mastiffs, cane corsos, great danes, alaskan malamutes, and siberian huskies. All other dogs are welcome so long as they are up-to-date on their vaccinations before visiting our facility. Pets are to be kept on a leash and never left unattended outside your camper. Barking dogs will be required to leave. Pet waste must immediately be picked up and disposed of properly. Pets are not allowed in any building, swimming pool area or on the beach. Alcohol should be consumed in moderation. Alcohol use by underage campers in campground is not tolerated - violators will be asked to leave. Drunkenness, profanity, fighting, indecent exposure or any other disorderly conduct is prohibited. Smoking is not permitted in any campground building, at the beach, pool or playgrounds. The use of loud speakers, public address systems, or floodlights during quiet hours is prohibited. Radios and TVs should not be heard on the next site. …A participant in a recreational activity accepts the risks inherent in the recreational activity of which the ordinary prudent person should be aware. Act within the limits of his or her ability. Heed all warning regarding participation in the recreational activity. Maintain control of his or her person and equipment devices or animals the person is using while participating in the recreational activity. Refrain from acting in any manner that may cause or contribute to injury to him or herself or to others while participating in the recreational activity. Thank you for reading our campground rules.